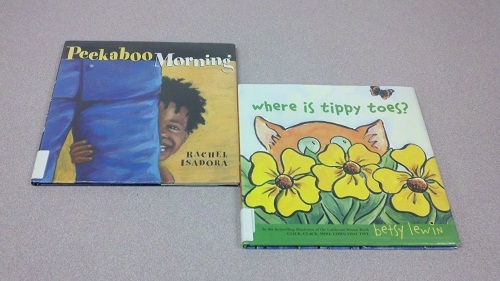 We recently started offering a Toddler Time storytime for our nearby preschools/daycares. We do this special storytime once a month, and I’ve been assigned to them in July, August, and September (and hopefully October, November, Decemeber, etc.). I am absolutely loving this storytime, and I was so excited about August’s bug theme that not even a bad sinus infection could stop me! 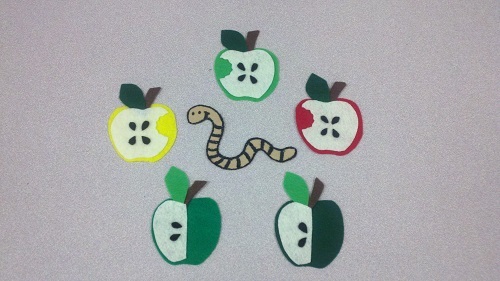 Hand out various food and retell the story. Children put the food on the flannelboard when the time comes. 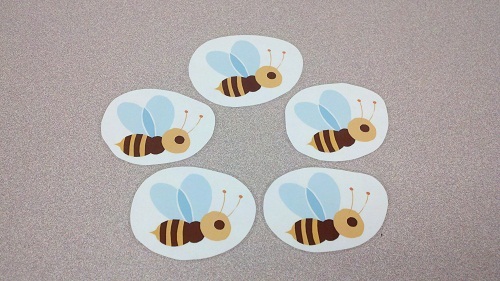 I created movement cards based off of bugs: wiggle like a worm, flutter like a butterfly, jump like a grasshopper, buzz like a bumblebee. For this activity, I would randomly select a card and we would move like that bug. The kids loved it! Yesterday I did a great theme with the toddler crowd: Messy! You know how every now and then you’ll do a storytime and just feel like everything has gone perfectly to plan, and everyone leaves happy? Well, that was what happened yesterday. 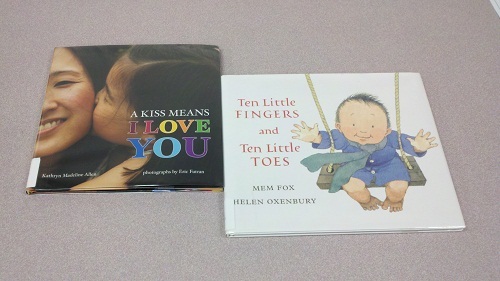 The toddlers loved the books, rhymes, and games, and the parents seemed pretty darn happy too. Very, very well. Normally I would consider Hogwash to be too long of a book for the toddler crowd, but because it’s written in rhyme, and because I read it first, it ended up working well with this group. I made sure to pause every now and then to ask questions, specifically what noise does such and such farm animal make. It helped keep the kids engaged with the book. 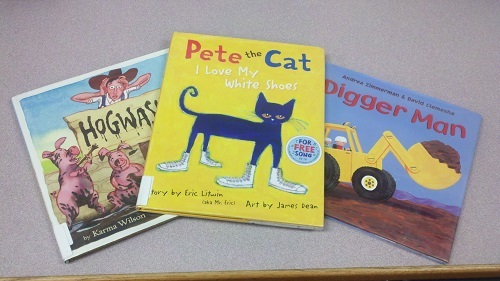 Pete the Cat is always a huge hit in storytime due to the song, and Digger Man was a good book to end with due to being short. Since I couldn’t find too many messy rhymes that I liked, I stuck with just two and then did traditional rhymes for the rest. 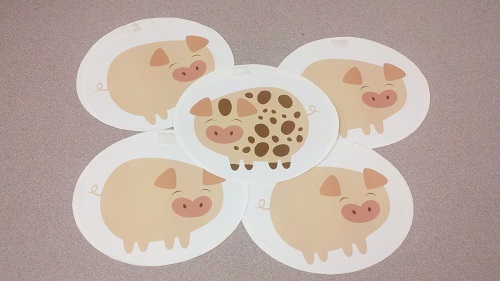 For Lady Rides, I instructed the caregivers to hold their toddlers in their laps and bounce them along with the rhyme. We start slow for lady rides, and then go faster and faster until we’re all crazy like for cowboy rides. One little girl liked it so much that she said, “Let’s do it again!” when we were finished. But I have to say that the biggest hit of storytime was Ring Around the Mud Puddle. I was fortunate enough that the program room we use in the summer is pretty big, so I was able to cut a huge mud puddle out of brown butcher paper and tape in on the floor in an area where the children wouldn’t necessarily see it until it was time to play. After I read Pete the Cat (which has a mud puddle in it), I told the toddlers that there was a mud puddle in the room, and could they help me find it? We went on a mini scavenger hunt for it, and when the toddlers found it, they immediately jumped on it as if it were a real mud puddle! The caregivers and I gave them a few moments for pretend play in the mud puddle before I instructed how to play Ring Around the Mud Puddle. We all stood around the puddle and walked around it, and then at the end the toddlers jumped in! We did this one several times. I know I say this a lot, but this plan went very, very well! The Wiggle Worm game was a great change from traditional rhymes, and it taught the toddlers about taking turns (and once we discussed how we take turns, they were very good about waiting patiently for their turn). I think the caregivers also loved this game because they got a change to wiggle with and hug their littles! While we were reading Mouse Was Mad, a 4-year-old started up a discussion about what it means to be angry. Then, at the end of the book, several preschoolers commented that Mouse was no longer angry; he was happy! So I then changed up my routine and launched into a rendition of If You’re Happy and You Know It (if you check out the PDF below, you’ll see that I originally planned on singing ‘Here is a Bunny with Ears so Funny’). After we did the traditional “If you’re happy and you know it, clap your hands…” we did another round with stomp your feet. 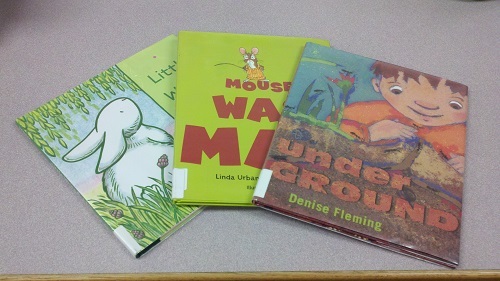 And one astute preschooler pointed out that Mouse had stomped his feet when he was mad. So then I used that opportunity to ask the children what else Mouse did when he was mad, and we ended up singing “If you’re happy and you know it, hop up and down/roll around/scream.” What a great way to retell the story! I’ll definitely be doing this again the next time I read Mouse Was Mad! 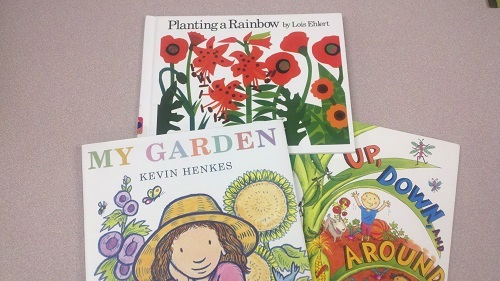 My regular preschool storytime is on hiatus during June and July (we do celebrity storytime instead), but I am providing Toddler Time every other week during the summer. 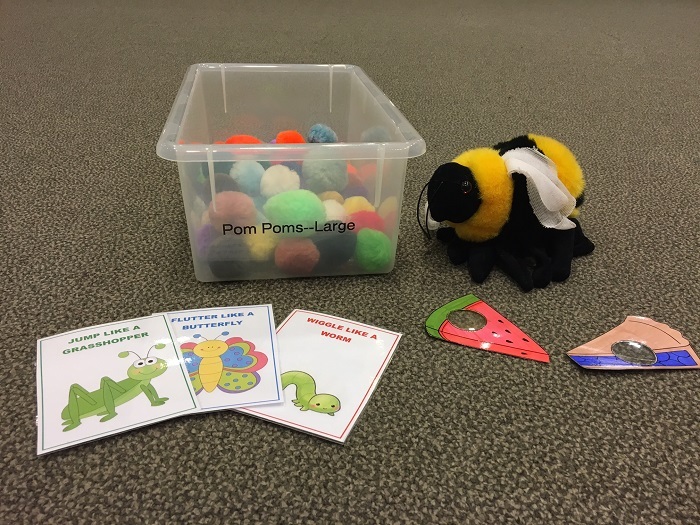 Today was the first Toddler Time of the summer, and I’ve changed up my routine a bit — I added an extra book and an extra rhyme and brought my rhyme cube along for some extra movement fun. I was very nervous about this Toddler Time. It was the first time I did Toddler Time in the summer. I was in a different room with a different set up than what I’m usually used to. I also wasn’t sure how big of a crowd I’d get, so I had to plan for the unexpected and be very flexible. Everything worked out in the end, though. I had a medium sized crowd that consisted mostly of mothers and toddlers who’ve been coming to my storytimes for months. They were very happy to be there, and we all had so much fun with the rhymes and books! 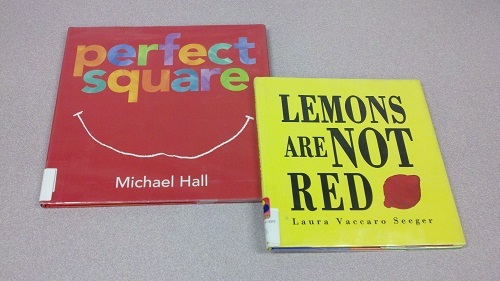 I have to say that Five Little Apples and Five Green Peas were the favorite rhymes (the toddlers also really loved the rhyme cube…it was the first time I used it with this age group). And, of course, Up, Down, And Around was the favorite book because I instructed everyone to stand on their tippy toes for up, crouch down by the floor for down, and turn around for around. I recently purchased Books in Motion by Julie Dietzel-Glair, and I’m looking forward to using some of her ideas to increase movement during the stories. Due to summer reading planning, school visits, etc. I have fallen behind on posting my Toddler Time plans! At the very beginning of May, I did a shapes and colors theme that went fairly well. SHAPE, SHAPE, WHAT DO YOU SEE? Is it sad that my memories from a couple of weeks ago are a little fuzzy? 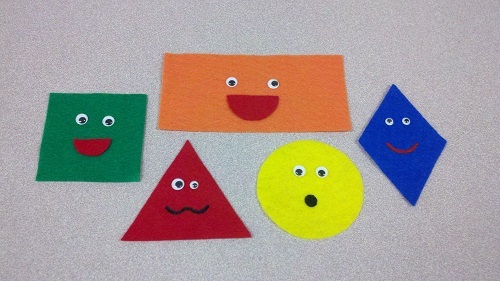 I remember that Shapes and Green Says Go worked really well with the toddlers. If You’re Wearing… also worked, but, as usual, every toddler did every movement regardless of what color they were wearing. I would also definitely read both books again with toddlers. I’m taking the fact that I don’t remember any catastrophe happening to mean that this theme went very smoothly. We are approaching the end of the Spring session of Toddler Time! I had a very small but very well-behaved crowd today. OH WHERE, OH WHERE IS MY BABY’S HAND? Last time we did bubbles in Toddler Time, it was a little chaotic. This time, it was much better! Before I started the bubbles, I explained to the toddlers that we’d have to take turns and share the bubbles with one another. While there were a few toddlers who were trying to hog all the bubbles, most of them took turns popping and were very considerate to others during the bubble popping. It ran a little short (I could have extended it by blowing more bubbles, but I ran out). 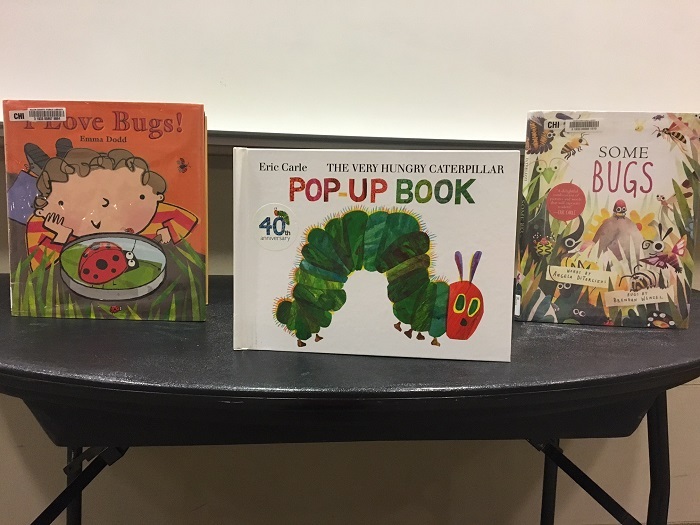 However, everyone really loved the peek-a-boo rhymes, and even some of the more rambunctious toddlers listened and participated during the stories, so I would say that this theme is great for toddlers! I would definitely use everything again in the future, and maybe just add a few more peek-a-boo rhymes. 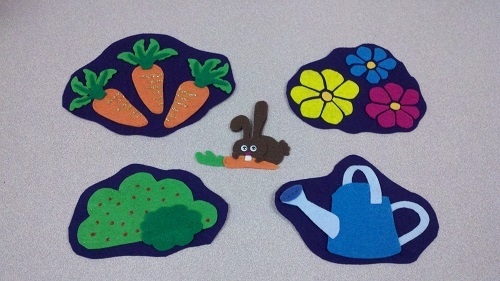 One of the things that I love about Toddler Time is the chance to do new themes that I never thought about doing for my Pre-K storytime. The They’re a Part of Me theme is one of those that I never had the chance (or even the inclination) to do with the older kids. Which is a shame because I’ve learned that there are a lot of great things you can do for this theme. We played a freeze game with the jingle bells today. We jingled them while the music played, then froze when the music stopped. Very fun! This week’s Toddler Time went so much better than last week’s. We had a larger crowd, which for some reason kept the rowdy kids from being too rowdy, yet they still had a lot of fun. 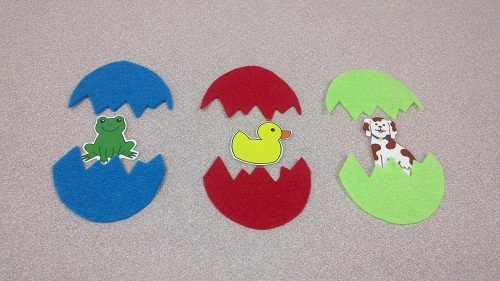 Everything — books, rhymes, activities — worked amazingly well, and I will definitely be doing this theme again!